The so-called Calla Lily is an herbaceous plant belonging to the Araceae, and is closely related to calamus, Jackin-the-pulpit, and arum. It is a native of South Africa, and, like most of the order, it prefers a very moist soil and warm climate. It has comparatively large sagitate leaves ; is monoecious, the staminate and pistillate flowers being in close proximity on the same plant. The plant is also known as Lily of the Nile, African Lily, and Ethiopian Lily. The word Calla is supposed to be derived from calyx, the first protective covering of complete flowers. The plant is very extensively cultivated in all countries, especially the warmer countries and islands. It is to be found in gardens, hothouses, and conservatories. The plant has evidently been known for many centuries. Some very misleading opinions and names exist with reference to this plant. In the first place, it is not a lily at all, belonging to an entirely different order. The Lily of the Nile is wrong, because it is a native of South Africa. To speak of the handsome flowers is wrong, because the part mostly admired is not a flower in the botanical sense, but simply a leafy involucral covering of a pure waxywhite color. The inflorescence proper is the yellow central cone-like structure known as spadix, and upon which the small, non-attractive staminate or pistillate flowers are closely crowded. 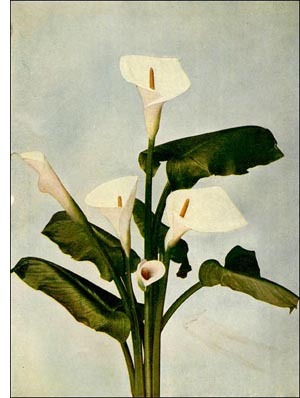 Calla, according to the etymology of the word, is wrong, for reasons already given-that is, it is not a true calyx, but rather a calyx or corolla-like involucre. It no doubt serves the function of a corolla in that it attracts insects for the purpose of effecting pollination.